If your job requires the use of keys and/or small items; you need the extreme durability and strength of Key-Bak original series. 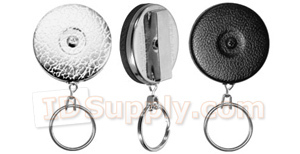 This Key-Bak retractable cord reel has a rugged 24" long stainless steel chain to keep your keys safe and secured. The back features a belt loop for maximum attachment security. Available in Textured Chrome Front or Black Vinyl. KEY-BAK® has been providing American Made Products and Innovation for over 60 years. Developed to help railroad linemen from snagging large, dangling key chains on trains, KEY-BAK® reels have become an invaluable tool in the daily lives of countless professionals in just about every industry. Not only are KEY-BAK® reels safer than traditional key chains, they’re also more practical and convenient—and even work great for small hand tools, gauges, flashlights, law enforcement and outdoor gear! From the First Retractable Key Reel, the Original KEY-BAK® in 1948, to the full line of Duty-Gear products in 2010, KEY-BAK® continues to be a Leading Innovator in manufacturing the Highest Quality Secure Access Control Products. Every KEY-BAK® product is backed by a Lifetime Service Policy.